16-day mission will involve five spacewalks to install laboratory "porch"
KENNEDY SPACE CENTER, Florida (CNN) -- Lucky 13: NASA, the U.S. space agency, is counting on it. 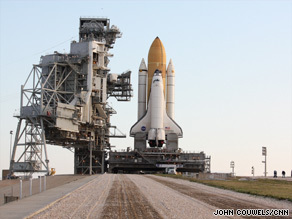 Space shuttle Endeavour is rolled out to its launch pad at the Kennedy Space Center. When the seven crew members of space shuttle Endeavour meet up with the six astronauts on the international space station in a few days, the 13 visitors from Earth will comprise the largest space get-together. Endeavour is set to blast off Saturday at 7:17 a.m. ET for a 16-day mission to help expand the space station. You can watch the launch on CNN.com/Live. With Endeavour's launch, 500 people will have traveled into space. The trip also will mark the first time that two Canadians -- shuttle astronaut Julie Payette and station astronaut Robert Thirsk -- have been in space at the same time. Someday, Payette believes, such milestones will be meaningless. "Today we make a big deal about two Canadians in space, the 500th person in space and so on and so forth," she said. "And maybe in some distant future, we're gonna look back and stop counting that kind of thing because it will be normal for human beings to be in space, to live in space." With all this activity, NASA hopes crew members don't get their messages crossed. "One of the big problems during the spacewalks and the robotics is going to be everybody trying to talk over the communications loop at the same time," said shuttle Cmdr. Mark Polansky. In many instances, who talks when has already been scripted. And it all has to be, said lead Flight Director Paul Dye. "This is one of the most interactively complex flights I have ever seen put together," Dye said. "It's an amazing piece of work." The mission's primary goal is to install what amounts to a porch in space. Endeavour is carrying in its cargo bay two platforms of the Japanese Kibo Laboratory, which is already part of the space station. One platform rides up and back on the shuttle, while the other will stay permanently fixed to the Kibo laboratory for scientific experiments that require exposure to space. "That is our No. 1 mission objective," said space station Flight Director Holly Ridings, "to get it out of the payload bay and successfully, permanently installed on the space station." For many of the 16 days, the station will resemble a construction work site, except that astronauts will be in space suits instead of hard hats and operating robotic arms instead of cranes. And just like at a job site, it will all be going on at the same time. "It is busy. It is a sprint race for us and it's very interactive and it takes every one of the  people," said Mission Specialist Dave Wolf, the lead spacewalker . The Endeavour mission comes shortly after the shuttle Atlantis' just-finished mission to repair the Hubble Space Telescope. On both missions, NASA is using online social networking to re-instill interest in the space program, particularly among younger generations. During the Hubble mission, astronaut Mike Massimino sent periodic tweets on Twitter, the micro-blogging site. On this flight, Polansky will get the Twittering honor. He doesn't hesitate to say that he's far more comfortable flying a shuttle. "I'll be the first to admit I didn't know a tweet from a Twitter from a Facebook from MySpace before I got into this, but as I've done it, I've learned there's a whole community of people that love this stuff and are following," he said. Four of the shuttle crew members are first-time flyers. Mission Specialist Tom Marshburn is a doctor and one-time NASA flight surgeon. Tim Kopra, a U.S. Army colonel, will be joining the station crew. Shuttle pilot and Marine Corps Lt. Col. Doug Hurley and Mission Specialist Christopher Cassidy (a former Navy SEAL) round out the newcomers to space. "In my mind the enemy is sort of what we don't know, the unexpected and the curve balls that will be thrown at us during the mission," Cassidy said.